I thought, to help get some creative juices flowing, and because I really wish I could enter my own competition this month, I’d share with an example of an origins piece written by me for this month’s Shell Case Shorts. It’s, unsurprisingly, about a Space Marine Chapter called the Void Stalkers. The exact date of the Void Stalkers founding is somewhat unclear within the records of the Adeptus Terra. Archives indicate that the first confirmed sighting of this little known chapter was during the Uribe Uprising 588-592 M39. After 4 years of grinding attrition that cost countless lives, and all but decimated the once plush garden world, the Imperial forces had driven the secessionist back to the walls of the Governor’s Palace. The Governor himself had been executed a decade before by his council of advisor’s who had turned from the Emperor’s light and embraced the foul whisperings of Chaos. The Kabal of Rebirth, as they dubbed themselves had locked down the palace and ordered their followers to fight to the last. The palace defences were such that not even siege cannons could breach its walls and all attempts to infiltrate the palace had been met with utter disaster. After 6 months of siege the ground between the Imperial liberation force and the palace was a plague choked quagmire of shell holes, razor wire and the bloated remains of thousands of soldiers, from both sides of the conflict. On the eve of the final push that would send tens of thousands of men and hundreds of tanks into the teeth of the palaces defences, in the hope of breaching the walls, a single jet black Thunderhawk gunship streaked through the leaden sky. Bearing a white dagger agaisnt a field of midnight blue, it failed to respond to any vox hails and when the order was given to shoot it down, the air defence batteries failed to register anything was in the sky at all. The Thunderhawk touched down just long enough to disgorge a single ten-man squad of Space Marines. Equally coloured in black with midnight blue pauldrons, and bearing the winged skull of the Imperium on their chests, the Void Stalkers moved through the crowds of gawping Imperial Guardsmen and officers without word or noise; the usual hum and mechanical clunking surrounding powered armour ominously absent. The Space Marines stood a top the trench network that ran like veins through the ground they stared intently at the setting suns of Uribe, their green eye lenses glinting with the last rays of the day. As darkness bled across the world the Void Stalkers walked into no-man’s land. As the suns rose the following morning there was no sign of the Space Marines but the palace gates now laid wide open. A scouting force was immediately dispatched. As the two Chimeras bounced over the ruined terrain every soul aboard expected to be blasted to pieces by artillery fire, yet they made it to the gates unhindered. Moving through the gates the Imperial Guardsmen were met with a charnel house. Bodies littered the walls, bunkers, gun emplacements, barracks, corridors and chambers. Every one of the traitors had been killed by bladed weapons of some description. It was only hours later when more units had been brought in to search the palace did the Imperial Forces find the ten traitorous members of the Kabal impaled to the walls of the throne room by exquisitely crafted combat that could only belong to that of the Astartes. The Void Stalkers’ reputation follows a very similar track through the 2,000 years since. The Void Stalkers arrive unannounced, often in small numbers, vanish within moments of arriving and rarely resurface but wherever they tread death follows them. Not only do the Void Stalkers have a flare for terror inducing wide-spread and bloody slaughter, they have a skill or more surgical operations, performing services to the Imperium that even the Departmento Assassinorum would balk at. Countless traitors & heretics have fallen at the hands of suspected Void Stalker intervention before their heretical ways could contaminate others. The brutality with which they carry out these executions and terror campaigns has been met with sanction from the High Lords and the Inquisition but if the Void Stalkers are aware they certainly show no interest. Beyond these low-level interventions there has only ever been 4 recorded instances of the Void Stalkers deploying in greater than company strength. The most recent was the Ork invasion of Ulgren 3, 811.M41, a planet populated with pre-industrial human tribes inhabiting the western continent. Located on the border between Segementums Tempestus & Solar it was of little strategic value yet 3 full battle companies met the Ork invasion and crushed it utterly. Only intercepted astropathic signals from the Void Stalker fleet to an indeterminate location gave the Imperium any indication that there was an Ork incursion at all. How the Void Stalkers knew of the threat and why they responded with such overwhelming force remains a mystery to this day. Beyond these scattered, and often second-hand, reports little is known about the Void Stalkers beyond their current Chapter Master is Vivos Finem, the third Astartes to hold that title in the Chapter’s history and this is only because Chapter Masters are required to attend the High Lords of Terra to renew the Chapter’s vows of loylty to the Imperium. It’s founding master was formerly the 5th company captain of the Raven Guard, Shinji Dasvaan. He served as master for eight hundred years before vanishing without a trace mid operations in the Uluhis Sector. Not even the Void Stalkers know where he went. Some believe he returned to his brother Raven Guard, others that he transcended. A few believe that he left the Silent Intent, the Void Stalker’s single battlebarge, in search of the last great kill. If the Void Stalkers have a homeworld there is no record of it although there are reports of small installations with the Void Stalker livery dotted across the entire Imperium. No one has thus far been brave enough or foolish enough to attempt to break into one to determine its contents but military experts hypothesise that they are resupply stations with capacity for no more than 10 Astartes at a time. Sightings of Void Stalker ships in orbit over various worlds for extended periods with no obvious sign of resupply or conflict has led to speculation regarding recruitment words but there is no indication of training grounds, temples or a fortress monastery. The only parallels that can be drawn from these suspected worlds is that they all posses pre-industrial civilisations, all are nomadic and all prefer skirmish and hit and run tactics rather than waging all out war against one another. Sharing geneseed with the Raven Guard, their ancestral home remains Deliverance and Void Stalkers periodically make pilgrimages their to walk amongst their kin and share tactics and intelligence. It is the one and only time that a Void Stalker will willingly remove their battle helms and walk and converse with beings other than their own battle brothers. The Void Stalkers hold the Raven Guard in awe and with the utmost respect. Every undertaking made by the Void Stalkers is measured against the achievements of the Raven Guards 10 millennia long history. Indeed, the day that Corax liberated Deliverance is the Void Stalkers’ most sacred day and where possible as much of the Void Stalker fleet gathers and a day of thanks giving is declared. It is a day of intense mediation, and purification at the end of which the entire Chapter, or at least as much as is feasible to gather, feasts in the great hall of the Silent Intent to represent Corax’s triumph and the birth of the 19th Legion. Much like other ‘crusading’ Chapters, the Void Stalker’s possess a large fleet, however, where they differ is that overwhelmingly their fleet leans towards smaller vessels; frigates and destroyers, allowing them to quickly and quietly disperse kill teams all over the Imperium, where they move from warzone to warzone doing the most good before moving onto the next. The only time, outside of Deliverance Day, that the Silent Intent will see one of its sister ships is for resupply or on those exceptionally rare occasions that decisive force is required. And such a feat of co-ordination is only achieved by a truly prodigious number of astropaths on board each of the Void Stalker’s ships. How such a feat came about is a mystery but can have only come about through extraordinary ties of kinship between the Void Stalkers and the Psykana Telepathica. The Void Stalkers, like their Raven Guard cousins, follow the Codex Astartes organisational structure in so much as there are 10 companies, each with 10 squads. However, where they differ is that the Void Stalkers do not use reserve companies in the convention sense, nor do they utilise devastator squads, preferring to utilise a greater number of assault marines. Even the 10th, Scout, company being divided between weapons and close combat specialists. Devastator Squads are considered too inflexible and slow-moving for the Void Stalker’s chosen style of combat and as such train tactical squads extensively in the use of special weapons allowing a balance between maximum hitting power and manoeuvrability. Their chosen style of combat is overwhelmingly geared towards low-level surgical strikes and assassinations. It is said that a Void Stalker can move so silently that one could loom over you and you’d never know it until it was too late. Eye witnesses describe the Void Stalkers as like living shadows. One minute they are there and the next they’re not, as if they slip into your blind spot. Even sentries struggle to remember seeing Void Stalkers despite the Astartes having no choice but to pass through their checkpoint. Although the Void Stalkers have and will take to the field in conventional warfare they much prefer to root out decay before the rot sets in. Five out of the Eight battle companies are seeded across the galaxy, each squad operating independently of their company. Squads themselves are often broken down into one or two men teams to infiltrate a world, seek out the alien, the traitor or the deamonic and destroy it. Due to this solitary style of combat Void Stalkers are trained to be incredibly independent and resourceful. Most have customised their armour in some way or carry additional equipment that will allow a Void Stalker to operate in the field for extended periods of time. In fact there has been numerous instances of supply officers catching Void Stalkers scouring Imperial Guard supply dumps for items or in workshops concocting bespoke pressure bombs and other such devices. A Void Stalker doesn’t reach this level of resourcefulness by accident. Aspirants and (for those that survive) initiates spend much of their time alone on Death Worlds required to survive the predation of an entire planet for months on end. It teaches aspirants two things – initiative and the art of the hunt. It is no coincidence that the worlds the scouts find themselves on have some of the most efficient hunters in the galaxy. The message is simple; be better or die. In reality, Void Stalkers do not stay scouts for long as the nature of their combat operations requires them to be afforded maximum protection that only the advanced stealth systems of the Void Stalker power armour provides. Company captains of the five Interrogation companies rarely deploy in operations unless a company strength response is required. Instead they stay aboard the company Frigate and use the retro-fitted communication and sensorum equipment to monitor the progress of their battle brothers and arrange for rapid redeployment as needed. Should a threat prove too great or the cancer of heresy too deep for one Void Stalker to cope with they call upon the aid of the three reserve, or Purification, companies to bring ruination to the enemies of the Emperor. As one would expect demand on these three companies is great and elements of the 1st company are relied on heavily as the Purification companies are often divided in half to tackle multiple threats. When Purification does come to a world their tactics on the field of war are reflective of their more clandestine opreations; strike, contain and eliminate. Stormravens and drop pods deploy elements with such overwhelming force that the enemy are crushed before they can react. This style of warfare, however, presents two majors problems for the Void Stalkers. The first being that it is impossible to determine the actual number of Void Stalkers active in the field as they can drop out of contact for decades at a time which requires the Void Stalkers to keep a far larger scout company than the Codex Astartes dictates or the Inquisition would prefer. The second is that the Void Stalker fleet is too widely dispersed to lent any real military support when called upon. Combined with their singular approach to war and the high number of smaller craft, they are more often seen slinking away from naval engagements rather than lending support, much to the consternation of the Imperial Navy. The knock on effect of this is that the fleet is sometimes unable to round up its operatives immediately often forcing them to make their own way home. This is, needless to say, a tremendous waste of a valuable resource. The Void Stalker’s achievements are legion but few are public knowledge as most prevent the outbreak of war before they start. The only evidence ever left behind after a Void Stalker has completed his hunt is the ceremonial dagger required to make the kill. The stylised eagle talon handle carved from ivory, to give the impression of an Aquila clutching a blade, is a potent symbol the Imperium over as the cost of betrayal. The excessive nature of the Void Stalker’s purifications, both in scale and brutality, as well as their penchant of terror tactics has made many in the upper echelons of Terra and the Inquisition extremely nervous of the Void Stalkers and where the dark and solitary path they tread may truly be leading them. As with all Space Marine Chapters, the Void Stalkers revere their Primarch and the Emperor. 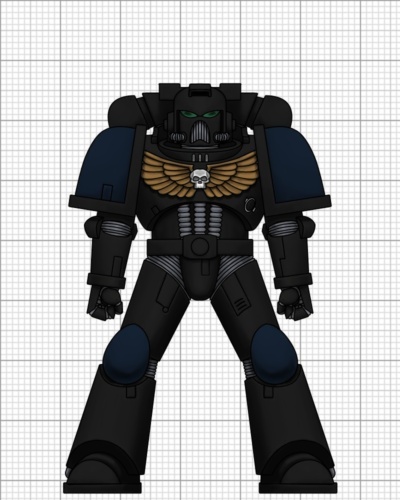 They also have a special admiration for the Raven Guard and follow their exploits intently, using them as exemplars. In many ways this veneration is tinged with a competitive streak as the Void Stalkers attempt to hone their stealth skills to beyond that of their cousins. At the core of the Void Stalkers belief system is that the Imperium of man is salvageable, but only through rooting out the rot that eats away at minds of the powerful and the weak. The Void Stalkers possess a wide and far-reaching intelligence network made up of clerks, Imperial officers, bounty hunters, gangers and even planetary governors. No one is beneath their notice and no lead too flimsy to follow-up. Often a Marine’s deployment will be as much as about observation – sometimes for years – as it is about dispatching an enemy of the Imperium. And sometimes, just rumour that a Void Stalker is at large on a planet is enough to quell the early stages of heresy, lest the instigators be made a violent and bloody example of the price of betrayal. This intelligence gathering earns them many favours across the realm of man, if not out of gratitude then fear of what the Void Stalkers know. Although they are quick to share information that can benefit brother chapters, the Departmento Munitorum or the Machine Cult of Mars they are viewed with suspicion and are tolerated rather than trusted. Favours usually extend to transportation when the Void Stalker’s own fleets are stretched too thin, or resupply and medical attention. The Void Stalkers are careful never to take too much less their allies become too resentful of the imposition. The Void Stalkers possess an almost preternatural awareness of their environment to the point that their reflexes are viper quick even by Raven Guard standards and excel in close combat to the extent that 70% of the Void Stalker’s 1st company are vanguard. This sixth sense is especially acute for the Chapter Librarians picking up on the slightest change in a battle brother’s aura, or even a shift in body language. So acute is this connection that the Librarians double as Chaplains and wander the galaxy on their own recognisances, arriving at the side of a stricken Void Stalker at just the right moment to either give them council or lend them martial aide. The Inquisition is deeply suspicious of this bond, have demanded numerous investigations and openly rail against those touched by the warp offering spiritual guidance to the Chapter but all objections have been ignored by the Chapter’s upper echelons, understanding, only as they can, the profound importance the shared connection is amongst a Chapter that works in almost complete isolation. The Void Stalker’s geneseed is taken from that of the scions of Corax. However, where the Raven Guard suffer loss of pigmentation ot their skin over time, it afflicts the Void Stalkers almost immediately, giving their skin an eerie, translucent, quality. Equally their eyes become inky pools and it profoundly disturbing for non-Astartes to look upon an un-helmeted Void Stalker for more than a few moments. Not that any living mortal has been given the opportunity to do so. Also, as with all sons of Corax, the Void Stalkers do not have the Mucranoid or the Betcher’s Gland. The Void Stalkers operate independently for months at a time and when unified it is to bring swift vengeance upon the foes of the Emperor, a duty they undertake with utter seriousness so a battle cry, to the Void Stalkers would be trivialising their duty to their father and the Emperor. Squad to squad communications are clipped and precise, and all missions are undertaken with the utmost discipline. This means the Void Stalkers lack the comradary and vainglorious bragging found amongst the rank and file of other chapters to the extent that on those rare occasions when they have been forced to fight alongside other chapters, they are largely ignored. Which suits the Void Stalkers just fine.